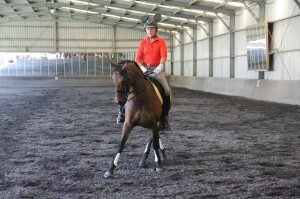 The Shoalhaven Dressage Club had good entries for their August competition. Unfortunately some of the riders scheduled for starts later in the afternoon were met with a freezing southerly change. The cold wind and rain put off many riders, and the brave few who faced the wild weather had to cope with horses spooked by the rain and wind. It was definitely an advantage to those who rode earlier in the day. High score of the day went to Kim McDonald and Dadirri Sensei. Kim scored 70.603% in the Official Novice 2.3. 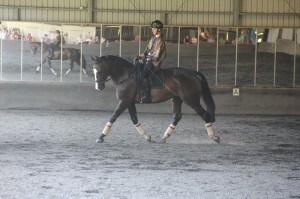 Kim and Sensei will be competing in the NSW State Dressage Championships next weekend. Kim will be joined by local riders, Jim Collin, Victoria Davies, Sue Rayner, Alycia Targa, Cathy Chittenden, Fiona Cox, Ebony-Lee Holz, Pamela Bice and Charlotte Phillips. This must be one of the largest contingents ever to represent the Shoalhaven at State level. Good luck to all riders. 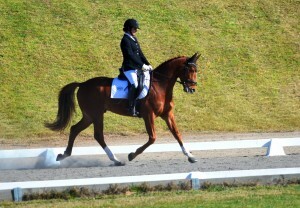 Shoalhaven Dressage Club’s next competition will be our Championships on the 29th of October. 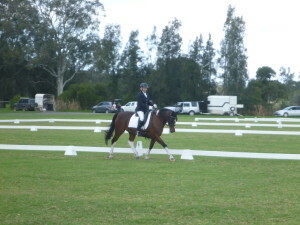 Shoalhaven Dressage Club held their final competition for the year on Sunday the 4th of December. It was a quieter competition to finish the year but many competitors took the opportunity to compete at a higher level in preparation for next years’ competitions. One of the outstanding performances came from Jim Collin riding Tibby Barbour’s Ampersand. This beautiful gelding showed he is a real talent for the future winning both of his official Novice tests with scores over 70%. Club President Alycia Targa also brought out her promising young horse, Neversfelde Kenya to win his first 2 starts at Medium level with good scores above 65%. Highest score of the day went to Ijesha Goerlach riding Wamenbri Tyson. This combination scored an amazing 76% in the Prep A. High scores were also awarded to Julee Jones and Jarmark Rosita in the Prep B with 72.632%, Jessica Steward and Waverley Frederick in the Junior Prelim 1.2 with 71.154%, Jim Collin again but this time on Robyn Targa’s Fawnae in the Unofficial Prelim 1.2 with 73.077%, Kaityln Gray and Rothwell Belgravia, second in the 1.2 with 71.731% and Junior rider Charlotte Phillips on her young horse Aloha Gladiator winning the Official Prelim 1.1 with 71.364%. 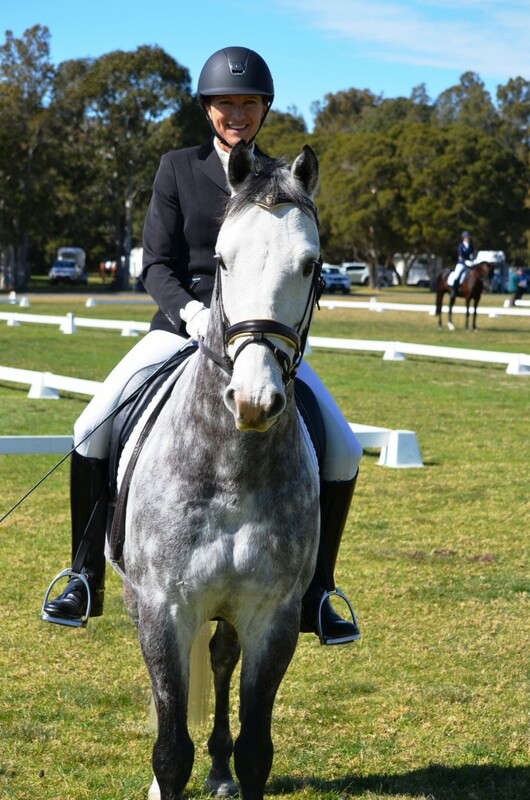 President of Shoalhaven Dressage Club, Alycia Targa, not only took on the challenge of organizing her first Club Championships this year, she also took the opportunity to ride (and win) her first Grand Prix test. Alycia was not without competition as local vet Gill Rickard, riding the beautiful Spanish Stallion Grandioso in his first Grand Prix test, was only 0.15% behind. Pamela Bice on the elegant Rosthwaite Tinkerbell had a personal best score to stay within a few percentage points of the bigger horses, coming in third. 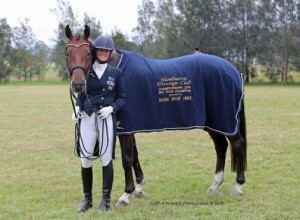 However it was Alycia and Jane Bruce’s 2016 middle tour NSW horse of the year, CP Dresden, who won the Big Tour Championship, scoring an amazing 70.263% in the Intermediate 11. Alycia was extremely pleased with ‘Mr Des’ whose piaffe work has improved dramatically in the past few weeks and is showing huge talent for such a young horse. Generous sponsorship from many local businesses meant that there were rugs for the champions of each level as well as pony and junior championship rugs. The award for the highest percentage of the day went to committee member Julee Jones and her pony Jarmark Rosita scoring 73.5% in the Prep C. However Elizabeth Sugar ensured it was a close race between ponies for the Berry Vet Clinic Supreme Champion SDC member. Liz and her pony Evergreen Honey just edged out Julee by 0.0265%! You can’t get much closer than that. The Rosevale Angus Small Tour championship was also a closely contested event with the top 3 competitors all finishing on equal points and the final result coming down to highest percentage scores. Champion was Gabrielle Jones on UQ Anapavlova, reserve Jodie Newall on Jive Matrix C, with Kim McDonald on Warburton Regatta only 0.07% behind in third. 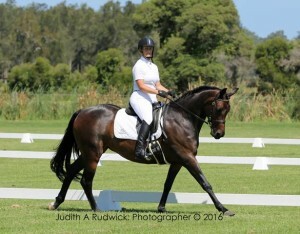 Geri Wheeler rode Hillsvale Ferroven to win Neversfeld Performance Horses Champion junior rider. Google any of these programs for youtube tutorials and help. Yes it takes hours – and no, you’ll never think it’s perfect! Challenge – Get working on your freestyle for our November Championships – Free Entry! Talented young Shoalhaven Dressage rider, Angus Fripp, competed with great success at the recent Australian Youth Dressage Championships held at SIEC on the 1st to 3rd of July. Angus won the Novice 2.2 with a great score of 70.571% and placed 7th in the 2.3 with 67.207% to end up 3rd overall. 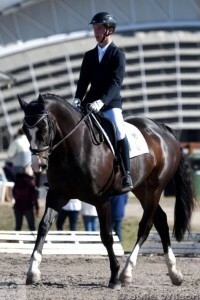 Angus and Remy also competed in the Elementary with good scores. Angus was a member of the NSW A team. 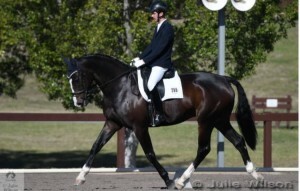 Congratulation Angus, all members of the Shoalhaven Dressage Club are proud of you. 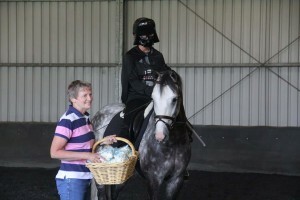 Whilst the weather for Shoalhaven Dressage Club’s June competition may have been cold, the competition was hot. 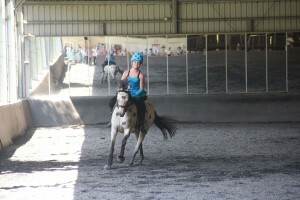 Many riders took the opportunity to try out a higher level or to bring out a young horse for their first competition. Top score of the day went to Pamela Bice riding Wealth in the Prep B with 72.632%. This was Wealth’s first outing and he is a beautiful moving horse with a super temperament who will be one to watch for the future. 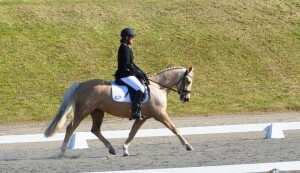 Wealth and Pamela also won the Prep C with 70.5%. Di Walker and Shamazan Morning Sun won both of the unofficial Preliminary tests whilst Lucy Koder on Angus won both of the junior Preliminary tests. Robyn Targa rode Furst Fling to win both of the Elementary tests and Ann Behringer rode Rosehill Rhythm to win the medium competitions. Para equestrian Victoria Davies with her beautiful Spanish Pre Stallion Andaluka Elegido gave Ann some tough competition in Victoria’s first attempt at Medium level on her stallion. One of the highlights of the day was watching local vet Gill Rickard and her lovely stallion Grandioso MG winning the Intermediate A. This was their first attempt at this level and despite a few errors ‘Grandy’ showed he has lots of talent for the Grand Prix movements. 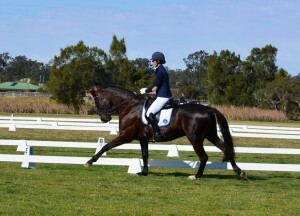 Shoalhaven Dressage Club’s next competition is on Sunday the 28th of August. Other riders to be rewarded with scores over 70% included Di Walker and Shamazan, Shelly Rinaldi and Illenordic Boston, Jessica Steward and Ellengowan Rosie, Fiona Cox and Anwen Got Flair, Liz Sugar and Evergreen Honey and Kristen Smith on Broadway Park Choir Boy. 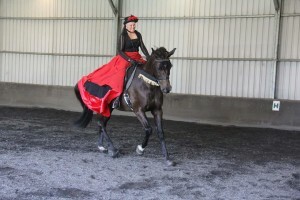 In the Novice tests Sandra Steward rode Waverley Freya to win both of the unofficial tests whilst Georgia Williamson rode Braefoot Park Secret Show to win both of the official tests. Robyn Targa rode the very tall Furst Fling to win both of her Elementary tests. Jeff Adams rode the well performed Weejazzper to win both of his Advanced tests and Kim McDonald kept up her good form to win the Prix St George and Intermediate 1 tests. Special mention must go to Club President Alycia Targa who despite only giving birth to her first child (daughter Bethany) a few weeks ago, still organised the entire competition and ran the office for the day. Alycia is obviously a multitasking expert. On the Saturday prior to our February competition, as the rain came pelting down, some of us were concerned that our competition would have to be cancelled. However the rain proved to be a blessing, softening up the grounds so the horses could enjoy the softer going, and the competition went ahead under clear sunny skies. 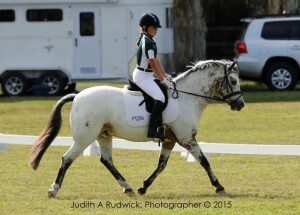 Our first competition for 2016 saw some wonderful tests ridden. High score of the day went to Sandra Steward and Waverley Freya with 73.889% in the unofficial 2.1. Sandra was closely followed by Angus Fripp riding Maxine Fripp’s lovely mareTW Francheska with 71.111% and Kirra Alder on Mystere Mi with 70.556%, it was certainly a very competitive class. Other noteworthy performances were achieved by Madeleine Phillips on Swanreach Gold Charm achieving 71.579% for a win in the Junior Prep A and 67.632% to win the Junior Prep B. Jenifer Symes showed the elegant Bellissimo King Hit in the Open Prep A to win with 71.316%, Jen continued her good form to also win the Prep B.
Jeff Adams won both of the Official Advanced tests on the lovely Weejazzper and Angus Fripp coped well with the upgrade to Elementary with Foxwood Remy to win both of the official Elementary tests. 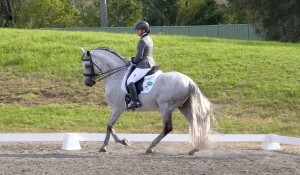 Pamela Bice had a great day on the grey pony Kooralyn Serena to win both the official Novice tests, and Caitlin Hancock rode Eden Park Ivory to win both of the Junior Novice tests, scoring 71.111 in the 2.1. Thanks to the committee for organising such a well run competition. Our next comp is on Sunday the 24th of April and entries are now open on Nominate. Sunday the 10th of January saw Shoalhaven Dressage Club converge once again at Maxine Fripp’s beautiful indoor arena to present our Horse and Rider of the Year awards. This year we had some fancy dress freestyles to entertain the crowd before enjoying a beautiful lunch catered by Emporium of Berry. 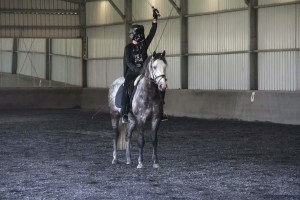 The first freestyle was Tempe Lees’ connemara gelding Ego Oliver and ‘Darth Vader’ riding to Star Wars themed music. Frances Simmons and Seal selected a Spanish theme and certainly impressed the crowd with their tempe changes up the centre line to start. Tracy Stead riding Anchorbar Alfonso also had a Spanish theme and finished their test with some Spanish walk that again had the crowd cheering. Madeleine Phillips riding Gracie then did a beautiful test with some very cute music that really suited this combination. Next on was Angus Fripp riding the beautiful Foxwood Remy. This combinations is starting to show what they are capable of with a beautiful test to a Samuri theme. 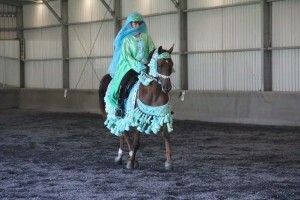 Charlotte Phillips rode her arabian gelding to an appropriate arab theme. Charlotte has completed her first year of dressage riding by taking out the Horse and Rider of the Year award for Shoalhaven Dressage Club. A fantastic result for a talented rider. However the winner of the freestyle competition was Pamela Bice and Rosthwaite Tinkerbell who rode an amazing Grand Prix Freestyle. The final passage/piaffe tour had the crowd clapping and cheering. All riders were encouraged to bribe the judges, so quite a few lollies, popcorn and fortune cookies were tossed around to encourage higher marks. The audience held up scores out of 10 for harmony, music and entertainment and Pamela won with a score of over 10??? A huge thanks to Maxine Fripp for letting us use her beautiful property once again for our presentation day and to Angus Fripp for preparing the property so beautifully. 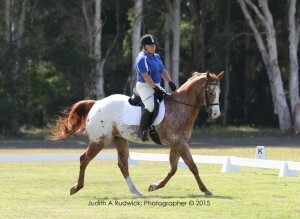 Shoalhaven Dressage Club held its final event for 2015 on Sunday the 6th of December. Whilst numbers were down, the competition was still strong as riders competed for points towards the yearly point score competition. Junior riders certainly took the honours with top scores across the board. Highest percentage of the day was awarded to Charlotte Phillips and Rose Gum Goldrush scoring 77.286% in the Open Novice 2.2. Charlotte also won the Open 2.1 with 73.333%, thus securing her win as Novice Horse of the Year and overall Horse and Rider of the Year for 2015. 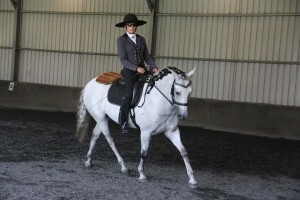 This is a fantastic effort for a rider who has only been competing in dressage for a year. 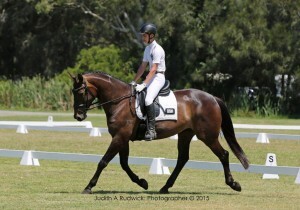 Another junior rider competing in the open classes, Angus Fripp, had 2 horses to ride. He had the second highest score of the day on TW Francheska in the Prelim 1.2 scoring 76.154%, and placed second in both of the Novice tests with great scores, 73.429% in the 2.2 and 68.519% in the 2.1 on Foxwood Remy. Angus finishes 2015 as Male Rider of the Year. Another junior rider, Geri Wheeler won both of her junior novice tests on Glengannon Artorious with scores of 75% in the 2.2 and 73.3% in the 2.1. Geri cemented her place at the top of the junior rider of the year point score for 2015. The 2015 Pony of the Year is Comet ridden by Emma Tinslay and he certainly showed that he deserved this title with big wins in the Pony Preliminary and Pony Novice tests, scoring 73.077% in the Prelim 1.2. However the Juniors did not win everything on the day, Ros Quist, one of our over 25 years riders won both of the Prep tests with her new horse Resolute. This was their first competition together and they really look like a combination that suit each other doing 2 lovely tests. My own Bokki also took advantage of the quiet day and uncrowded warm up areas to win both of his Advanced tests with scores of 70 and 71%. Very pleasing for his first attempt at this level. Our next competition is the 28th of February 2016. Presentation Day is on the 10th of January 2016 once again at the beautiful indoor arena of Maxine Fripp. It will involve freestyles, details will be advertised soon but start preparing your music!! !